There are two types of salespeople, generally speaking. There are the sales people who hold tight to the 80’s style. You know, Wolf of Wall Street type of selling. It’s all about them and making the commission. About the benefit of the people they were selling to, not so much. Then, there are the salespeople who feel uncomfortable selling that way. They certainly want to make money, but they don’t want to do it at the expense of their sense of what’s right or wrong. If you’re the first type of salesperson, the kind that’s out to get what’s “rightfully” yours at the expense of someone else, this isn’t for you. This is about how to better embrace the concept of providing value to the Buyer—an idea that is alien to many sales folks. However, if you’re the second type of salesperson, you’ll love this. This is similar, in many ways, to Zig Ziglar’s claim that “You can have everything in life you want, if you will just help enough other people get what they want.” Lean Thinking focuses on the other people part of that quote, making the sales process about them, not you. This famous quote doesn’t mean that sales is about giving things away for free. Rather, it reflects what great salespeople already know and do well. They help buyers find and acquire the things they want. Unfortunately for salespeople who are operating on outdated beliefs, that may not realize that their highest purpose is to provide value to their Buyers. Many salespeople hold the belief that the more activity they create, the better they’re doing. All activity is good activity, they think. Many sales managers reinforce this notion as well. After all, it looks good in reports to higher-ups to show how many calls their team made. The Lean Thinking belief is the opposite: less activity is better. Not because less activity is better for an arbitrary reason, but because activity for the sake of activity is simply a waste of precious time. It is a waste of the Buyer’s time. It is a waste of the Seller’s time. Why? Because it does nothing to further the sale. Most salespeople provide as much information to their Buyer as possible, believing that the Buyer will appreciate having all the information at their fingertips. This isn’t true. While some Buyers may appreciate a deluge of data, most get overwhelmed, Ironically, they view the information dump as a sign of a lazy salesperson who can’t save them time by only sharing relevant information. Far from feeling like they have what they need, too much information that the Buyer hasn’t requested leads to a Buyer feeling as though the seller didn’t bother to understand what the Buyer wants. It complicates things, and slows down the sales process as the Buyer sifts through all the information provided. This is why the Lean belief is to provide only the information if it is relevant. How do you know whether the information you are thinking of sharing with a prospect is relevant? Ask yourself the question, “Is this information likely to accelerate a Buying decision?” If the answer is less than an enthusiastic affirmative, keep it filed. Will the additional information will provide any value for the Buyer? If not, don’t give it to them. They won’t appreciate it, and the sale isn’t moved any further along the pipeline to closing. Another common belief I’ve blogged about is that “sales just take time.” Implicit in this belief is a resignation to painfully long sales cycles. The Lean Thinking belief is the sales process could always go a little faster. This is a mindset of continuous improvement. Sales managers tend to avoid considering this, as it requires an uncomfortably close look at how their department is run. “That’s just the way it’s always been” is a limiting belief that gives the company permission not to delve too deeply into where there might be wasted time and effort. Lean Thinking principles dramatically improve the speed of every process they are applied to. Sales is no exception. Has your own sales process been examined with a view to how well the Buyer is served throughout the entire process? If not, there are probably areas where improvements can be made. Finally, I can’t finish this blog without highlighting the deeply embedded sales culture of treading lightly when it comes to qualifying leads. Many salespeople are afraid of pushing too hard for fear of losing the opportunity. This is before they know yet whether the lead is a real opportunity! The Lean Thinking belief is to quickly and professionally qualify leads as early in the sales process as possible. This limits the amount of time spent on leads that were never going to buy from you at all. Any more time spent on qualifying than absolutely necessary is waste. There are many other important reasons to qualify your leads early on. Click here to read about them. Your Buyers will thank you for ensuring their time isn’t wasted, and you’ll be able to focus on prospects that are likely to buy. Next week, I’ll cover four additional outdated beliefs in the sales world that are hindering how well you can provide value to your Buyers. Sign up for the Lean Selling Journal in the blue box to the right to get alerted as soon as the blog goes live! You can keep the Lean conversation going by joining the Lean Selling Group on LinkedIn. About: Robert Pryor is a Lean Selling author and community builder as well as a CEO, speaker, and educator on cutting-edge sales processes. His new book is Lean Selling: How to Slash Your Sales Cycle and Drive Profitable, Predictable Revenue Growth by Giving Buyers What They Really Want. Follow by joining the LinkedIn Group “Lean Selling” or on Twitter @LeanSelling. 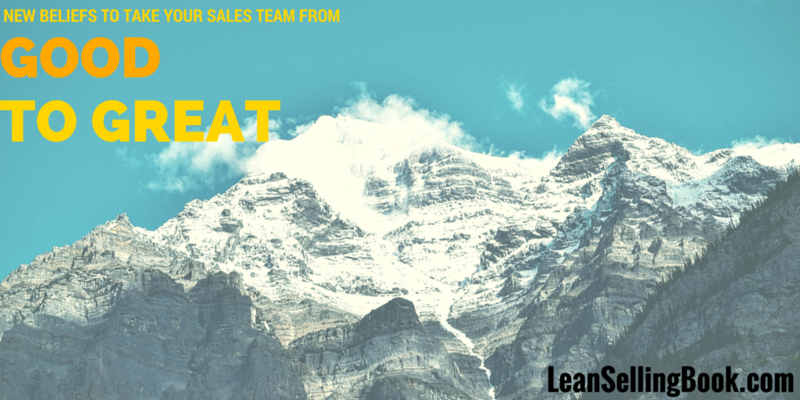 Do You Know How to Solve the Real Lean Challenge for Sales? Subscribe to the Lean Selling Journal - It's free!